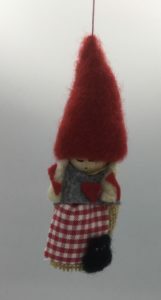 Home / STORE / Nisse / Norwegian Pixie. a quiet, hidden away place, where they can farm unhindered. The male farmer looks after the livestock and carries a bell so they know he is near. 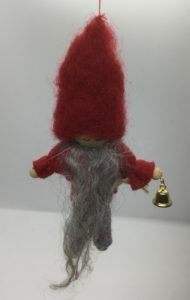 They love to hear his little bell and will run to find him. her little loyal cat following her everywhere. Approximately 9.5cm high with a thread so they can be hung.